Quick script is located in the Apps folder of NaughtyPE and it's use is rather trivial. You simply navigate to an application that you wish to include in NaughtyPE, select the .exe and choose where you wish to create a shortcut to the named .exe. Quickscript will then copy the folder, including the .exe and everything else that's in it, to NaughtyPE, using the foldername as name for the shortcut. NaughtyPE comes with a full set of drivers for all virtual machines, as well as a set of drivers for the most common sound cards. Since there is no such thing as common network cards. No network drivers, besides the ones for the VM, are included!!! Scroll down to "Add drivers from this directory (including subdirs):". Browse to the "some" folder. Other versions may or may not work as good, but are definitly not tested and therefore here not recommended! News: For some reason, during the last server move, some scripts have been replaced by older versions. Here are the latest files. Download, unzip and replace the files in your NaughtyPE. PS: Since i hardly see here any complains, the project must be eighter error free or nobody uses it. Can't believe it's error free! That one works better it seems and looks it also. Screamer wants to save to own folder, so one has to run it from ramdisk. 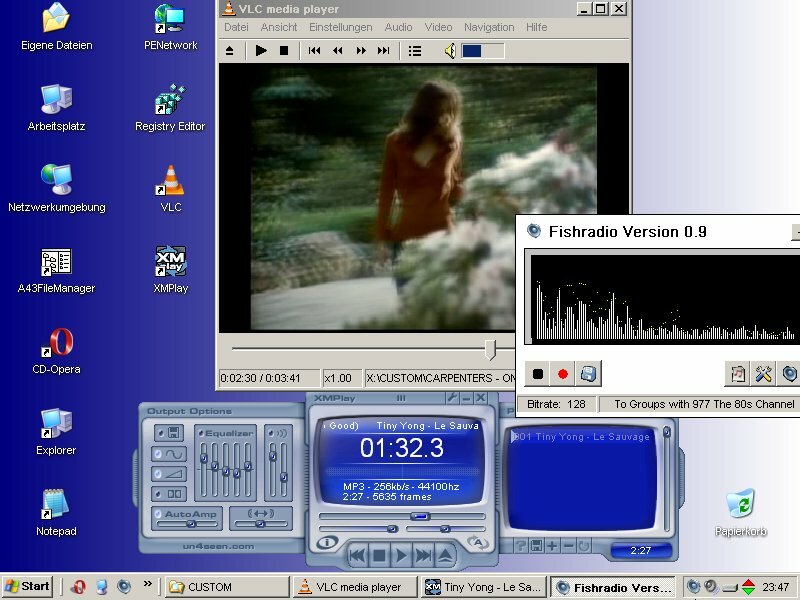 Fishradio reads and saves to wherever you want. PS: Especialy the statement about the looks is wrong. your project is unique in that vlc actually works. the only other project that i ve got it to work in is bartpecore. what other scripts did you add to your project that are needed for vlc??? If your project already has sound, the VLC script should be all you need. In naughtyPE, VLC depends on AudioXPE, XPE-AIO, UniVBE and depending on your settings on USB-Support. Simply use the file box to select the desired executable and check the boxes for the links you want created. Quickscript will then copy the folder containing the exe to 'programFiles' and created the requested shortcuts. Some people reported an annoyance with VLC, a message box popping up complaining about a missing dll. This problem is not caused by the script, but by a bug in VLC itself. Instead of loading the configuration first and then only the needed dll, VLC loads the dll it usually needs and then uses only the ones specified in the configuration file. That'S why after clicking the messages away, VLC works flawless. I hoped to solve this problem by including the plugin cache file into the script, which get's processed like the configuration file should. Unfortunately, this will only work if you have a german source too, else the absolute paths in the cache will not be correct anymore and the cache file is not used for startup. At the moment the only solution i see, is to include the 'missing' dll, eventhough it is not used. For doing this, you do not need to redownload anything, just enable the OpenGL checkbox on the XPE-AIO script. - Updated FindOnClick with Galapos newest version, should now work fine from ro media as well. Changed the USB-Support script, the previous one had problems with Hotplug. Took the chance and fixed a few glitches. MedEvil: bro i just tried ur naughtype and i must say its awesome. only 1 thing it lacks is good sound driver. it doesnt provide sound driver for my pc. my pc got realtek high definition sound card builtin. is it possible to add this driver?? as many of recent board are using this builtin souncard. cheerz bro. Before me going into writing a script for a driver that i can not test, let's try it the simple way. There are already 2 ways included with naughtyPE to add own drivers. - naughtyPE\Drivers\Audio XPE - "Add extra Drivers to %ScriptDir%\drivers"
MedEvil: i have already tried this. I copied the driver files with Double Driver option and created the folder with bunch of files then created the project. but it dint work. Don't use Double Driver it's not reliable. Now add the driver folder by one of the described ways to NaughtyPE. @Rashed most drivers require just the sys and the inf files to work. Since the mentioned 2 methodes didn't work for you, it's highly likely that your driver is more complicated and may ever require some system files or services that are not included. For weeks i was wondering, how could i possibly make NaughtyPE any cooler, than it already is? How about a Windows folder, actually called Windows? MPlayer is a video player, that's a bit easier on the resources than VLC. And though it does not support, to my knowledge, as many file types as VLC, it's still highly unlikely that you will run into anything MPlayer can't handle. SetResolution supports now hotkeys, to change the resolution and color depth on the fly, as well as a hotkey to start the taskmanager. Interesting! Will have to take a peek at what you've done. i386 is still resident in the build, but only has three files. Never said there wouldn't. Just that Windows can now run from a folder called Windows. btw. If you really hate it, use BootSDI and there will be no more 1386 folder in your drive X:. PS: If you happen to have an idea how to hide the i386 folder, i'm all ears. Thanks for the list Galapo, but this is not a bug, it's a feature! NaughtyPE is not LiveXP. It's main intend is not to be up to date with the newest gadgets, but to be stable. And therefore i employ, for NaughtyPE, the old handyman rule, if it isn't broken, don't fix it! Next update of system scripts will happen when NaughtyPE switches to WB076. Sorry, I wasn't at all trying to suggest a bug -- just giving an idea of what could be added if you were in the process of updating things. A couple of the scripts below do have bugs, though, I think from memory. Program scripts are mainly just updates. Nothing to be sorry for. Please read smileys too! So far i didn't discover any, nor did anyone report one to me. Anything that you'd remember from the top of your head? HoJoPE and Build Model had issues with spaces (or was it numbers?) in the path I think. WB Manager had something happening with it too. Peter will know better, of course.